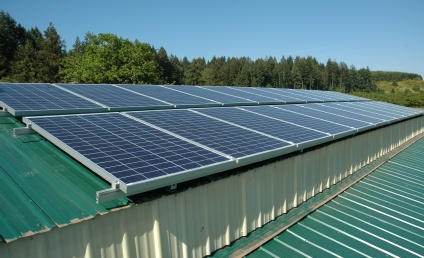 24 PV panels with a rated power of 4.7 kW produce electricity for our nursery, McKenzie Valley Bamboo. Two 33 sq. 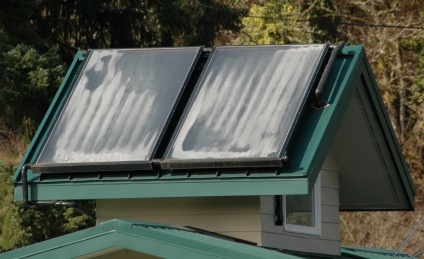 ft. panels capture the sun's heat which is used to heat our home's hot water and to heat the living space through the radiant floor heating system. System Details. How It Works. AC power and total daily energy sampled every 10 minutes. Each day plus a running average and the total for the year. Actual production compared to predicted production. Actual power compared to calculated power sampled every 10 minutes. Each day plus a running average. Today's path through the sky compared to the sun's path on summer and winter soltices. The relationship of sunrise times to sunset times. Thermal power and total daily energy sampled every 10 minutes. The last 12 months plus the current month. Each day plus a running average showing coefficient of performance. Hot water heating compared to radiant floor heating and their yearly totals. Solar thermal usage compared to electrical thermal usage. Average solar and electrical energy usage compared to the weather. Thermal energy split into the source of the energy and the end use. Temperatures and fluid flow in the solar thermal system as they are actually happening.